Anleitung, wie man in Visual Basic .NET einen einfachen Windows Dienst erstellen kann. 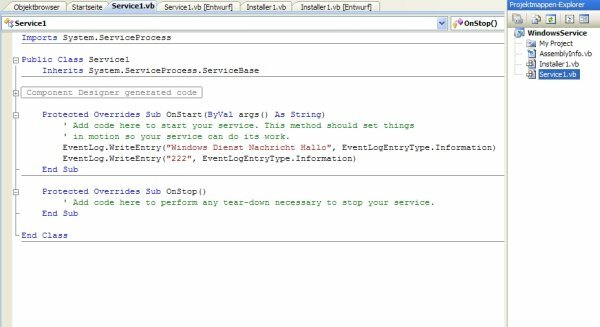 Private ServiceName As String = "Windows Dienst"
Private ServiceDescription = "Windows Dienst"
' als Wert des Schlüssels "Description" ein.
' [Dienstname] mit allen enthaltenen Werten löscht.
' Installer overrides dispose to clean up the component list.
' It can be modified using the Component Designer.
' Do not modify it using the code editor.
' This call is required by the Component Designer.
' UserService overrides dispose to clean up the component list. Dieser Tipp wurde bereits 25.030 mal aufgerufen.